Traditionally, haw mok comes in a banana leaf folded into the shape of a bowl. You can find frozen banana leaves at many Asian stores. When the banana leaves are not available, I use small dishes instead. The most popular haw mok are made with fish or crab but you’ll also find other meats as well. Fish like trout, tilapia, salmon or haddock tastes wonderful in this dish. Another favorite of the lining vegetable is bitters leaves from a tree that is widely grown in Thailand. 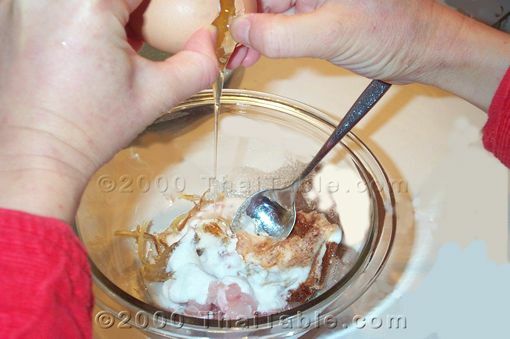 If you get a chance to have ‘haw moak’ in Thailand, ask for ‘bai yaw’. 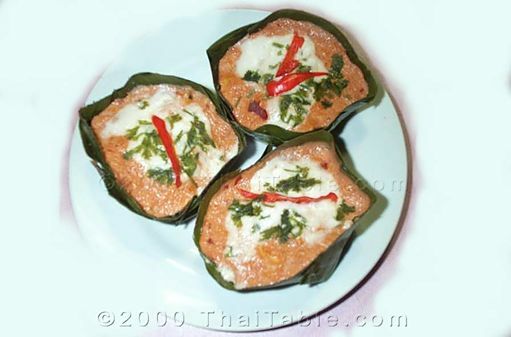 Red Curry Paste can be substituted for basic Red Curry Paste. 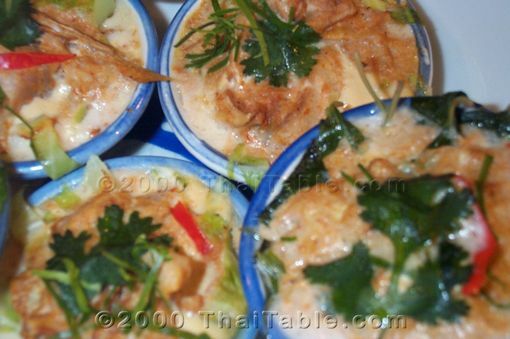 Haw moak can be viewed as 3 layer dish. The bottom: vegetables. 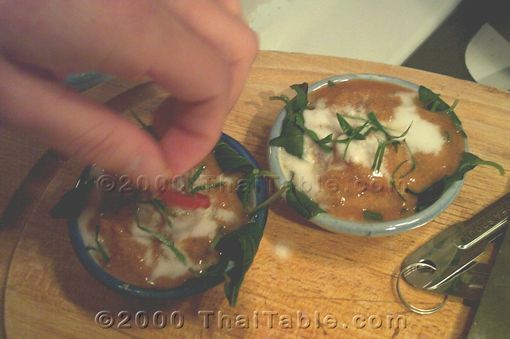 The middle: fish mixture And the topping: coconut milk with garnish. 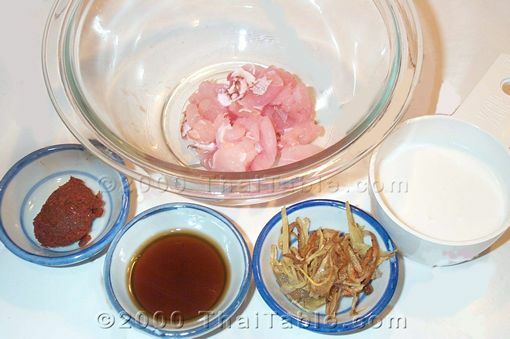 The middle: Mix the fish, curry paste, coconut milk, Chinese keys, egg and fish sauce together in a mixing bowl. I sometimes marinate the fish for overnight to get the flavors inside the fish. Slice the fish thinly will work, too. The topping: Put a few tablespoons of coconut milk in a small bowl. Add a pinch of flour to the coconut milk, mix it well and set aside. 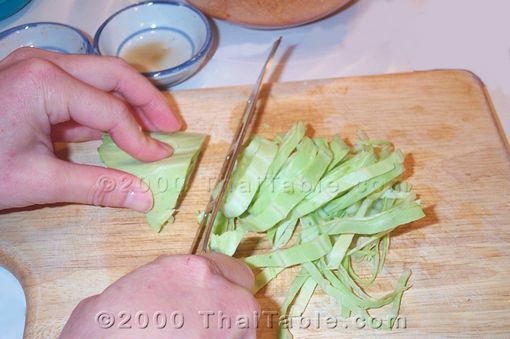 The bottom: Line the sliced cabbage or Thai basil leaves on the bottom of a small shallow dish. If your vegetables seem to fill up the dish, steam them until they wilt before add the fish. Add the fish mixture on top of the vegetables. Steam until the fish is cook, about 10 minutes. Then, spoon the coconut milk on top. 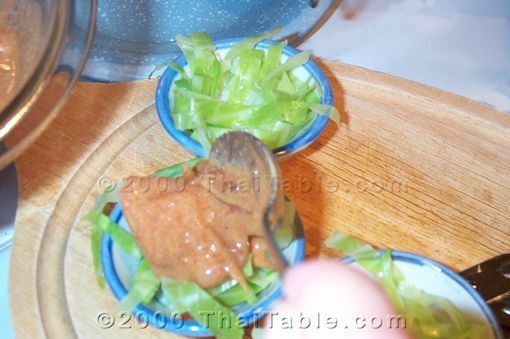 Sprinkle the kaffir lime leaves and cilantro leaves on top. If you have some red bell pepper or other red pepper, add a sliver for color. Steam for 5 more minutes. Serve hot with rice.